In June, Costco Wholesale (COST.US) fell more than 15% in reaction to the news Amazon.com (AMZN.US) is acquiring Whole Foods Market (WFM.US). We think Costco’s competitive advantage is durable and thus initiated a position. 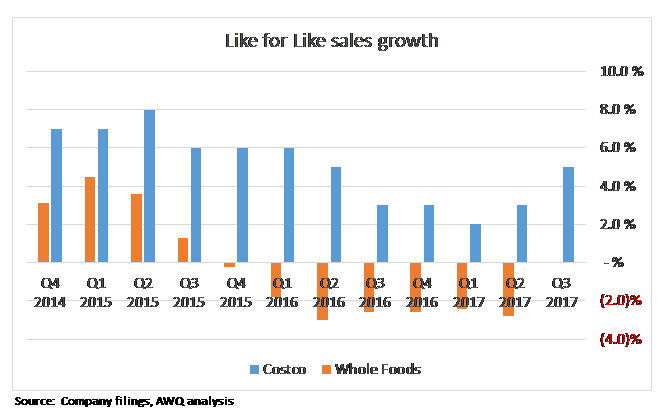 In the US, Costco has been taking market share from Whole Foods for a long time; this is manifest in like for like sales (LFL) where Whole Foods has reported declines for 7 straight quarters, yet Costco continues to report positive LFL results. Whole Foods’ challenge is complexity. Costco runs less than 20% of the SKUs1 that Whole Foods stocks, yet Costco stores are much larger (~148,000 square feet typically), implying sales velocity per SKU for Costco is significantly higher. 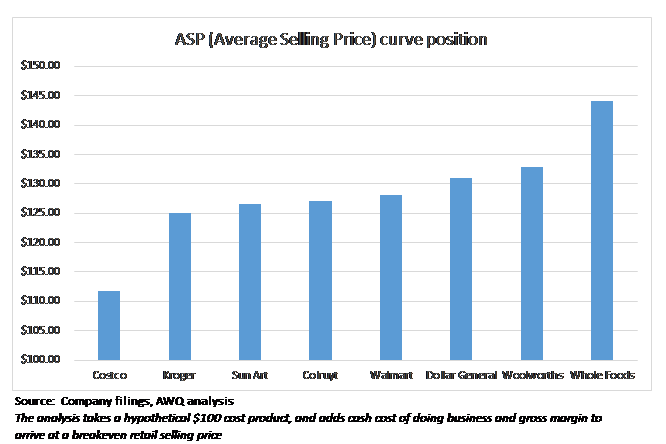 The complexity of Whole Food’s offering, reflected in high SKU count, drives higher costs in areas such as logistics, producer packaging, wastage, markdowns and labour. The Costco model involves as little human “touch” of product as possible. Costco’s distribution centres heavily rely on whole pallet cross docking. Imagine a supplier’s truck delivering a single product on 40 pallets to a Costco distribution centre. Now imagine 40 trucks like this from 40 different suppliers each with 40 pallets…and on the other side of the warehouse dock are 40 Costco store bound trucks being filled with 1 full pallet from each supplier truck. The Costco trucks are then dispatched to stores where whole pallets are loaded directly onto the sales floor. This is the conceptual rendering of Costco’s logistics model. In contrast, the high SKU count for Whole Foods necessitates a lot of human contact, and breaking down of pallets before shipment to stores (which, incidentally, is precisely where Amazon can add a huge amount of value). The difference in business model, which is apparent in the two company’s approach to logistics, manifests in margin structure. If it costs more to offer a product, it follows that the retailer is then forced to charge more to recover those costs. Referencing the last quarterly results for both companies, Whole Foods has a gross margin ~2.5x higher than Costco yet arrives at roughly the same net income margin. What this means is that if both companies acquired a product for $100, on average Whole Food’s shelf price would be ~30% more expensive. Given Whole Foods is colloquially known as “whole paycheck” in the US, it’s not really a secret, which is probably why like for like sales are down at Whole Foods and up at Costco. We have little doubt that Amazon will be able to improve on Wholefoods logistics efficiency (recall Amazon acquired Kiva Systems for their logistics robotics – see as an example (VIEW LINK). If you watch this YouTube video, bear in mind the lighting in the warehouse is for the benefit of the humans…the robots work just fine in the dark). If you’re thinking of who’s at risk from Amazon in food retailing, it is much more likely to be the archetypal supermarket, not Costco. Just look at the chart below. If a combined Amazon / Whole Foods can deliver lower operating costs and thus lower pricing, it is pretty obvious there are a lot of potential victims standing in line before you get to Costco. The point is that Costco has some structural efficiencies driven by offering format, which cannot be addressed by its competitors, including Amazon. This is why Costco’s LFL sales should continue to grow into the future. Bottom line is the customers aren’t dumb and know where it is cheaper to shop, which in turn drives LFL sales trends. Let’s hope the fear continues and we get a chance to build a larger position here.